"Do I need to install additional speakers outside the outward facing retailers on the perimeter of the shopping centre?" To answer this question, we need to refer to the National Construction Code / Building Code of Australia (BCA) and any related Australian Standards. 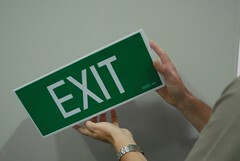 We often find signs on doors are non-existant or do not meet the requirements of the Building Code of Australia (BCA). The following is an short extract from the BCA 2009 that clearly outlines the requirements for fire safety doors. The Building Code of Australia (BCA) is produced and maintained by the Australian Building Codes Board (ABCB) on behalf of the Australian Government and each State and Territory Government. The BCA is a uniform set of technical provisions for the design and construction of buildings and other structures throughout Australia whilst allowing for variations in climate and geological or geographic conditions. According to an email I received from the ABCB today, the draft changes for BCA 2008 are available for public comment. The Building Code of Australia is a performance-based document that states the technical provisions that buildings and other structures throughout Australia must meet.